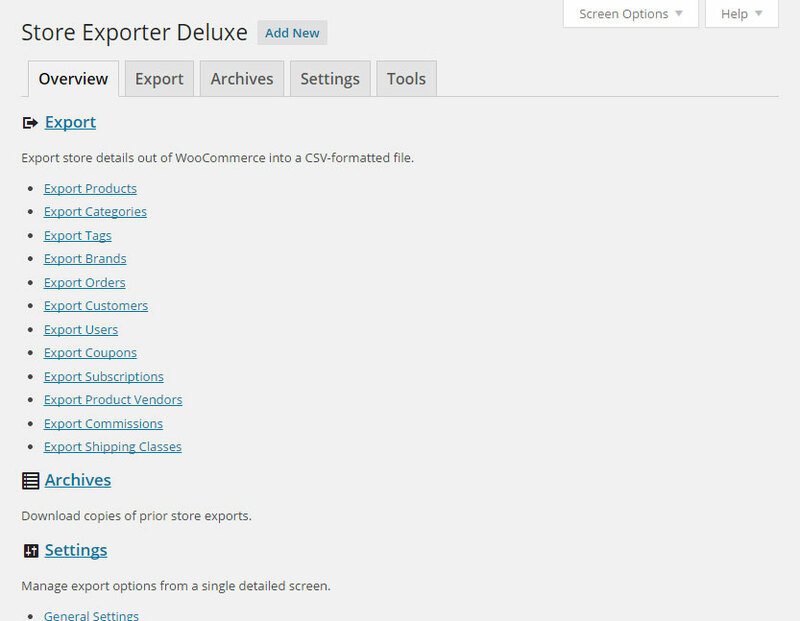 Unlock business focused WooCommerce exports with Store Exporter Deluxe. This Pro upgrade for our Store Exporter Plugin unlocks all of the business-focused features, filters and options so you can design advanced WooCommerce exports to suit your store requirements. 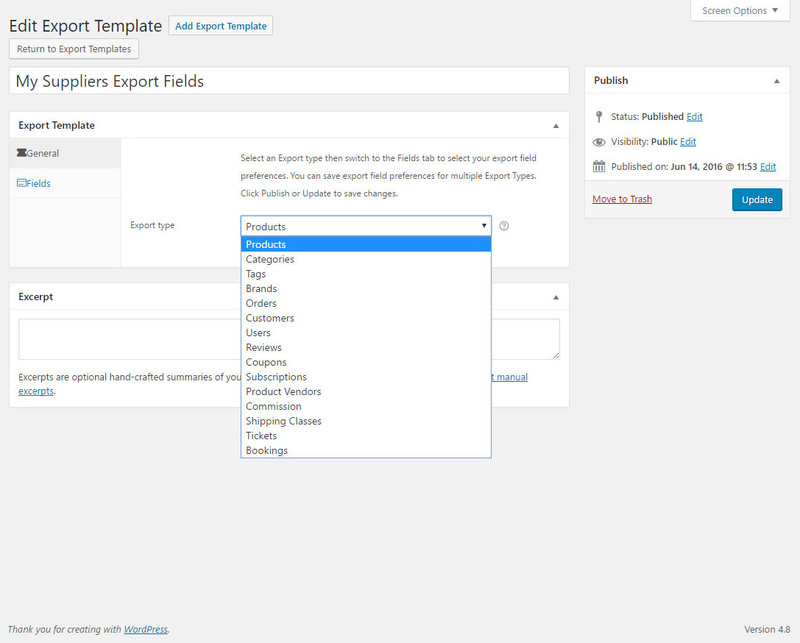 New export types are being added with each major Plugin update and regular minor Plugin updates add new export fields and filters ready to be included in exports. 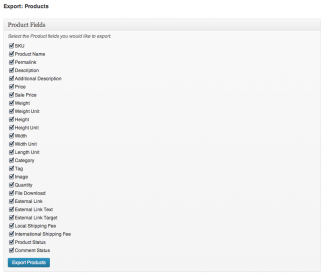 Why use Store Exporter Deluxe? Compatible with the latest WooCommerce release and legacy releases; all the way back to WooCommerce 2.3! Store Exporter Deluxe is unlike any other export Plugin as it natively integrates with 100+ WordPress and e-Commerce extensions to produce concise, filtered export data as opposed to simply dumping the raw data stored in Product, User, Order or Order Item meta. … and more free and Premium Plugins. Native support for additional Plugins are being added with each Plugin update and become available to export as soon as you update. 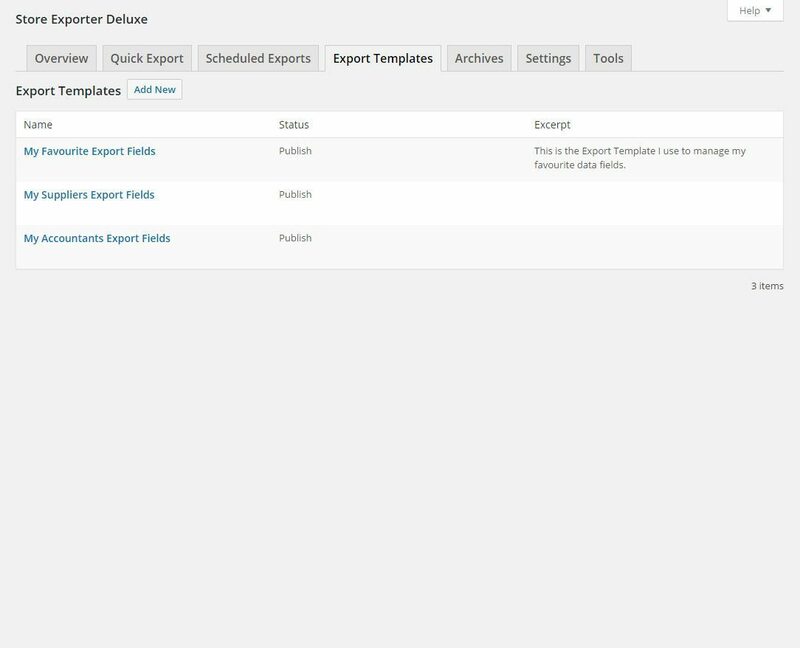 Store Exporter Deluxe supports multiple Scheduled Exports out of the box using the WordPress scheduled jobs engine (WP-CRON). 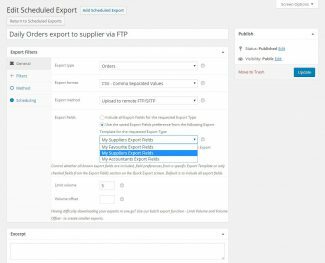 This ensures that exports run on time and are delivered in a timely fashion, in the event a Scheduled Export fails to run detailed reporting is available from the Scheduled Exports screen shown in friendly, easy to understand notices. If you’re in doubt, let us know how you want to use Scheduled Exports in the comments section. 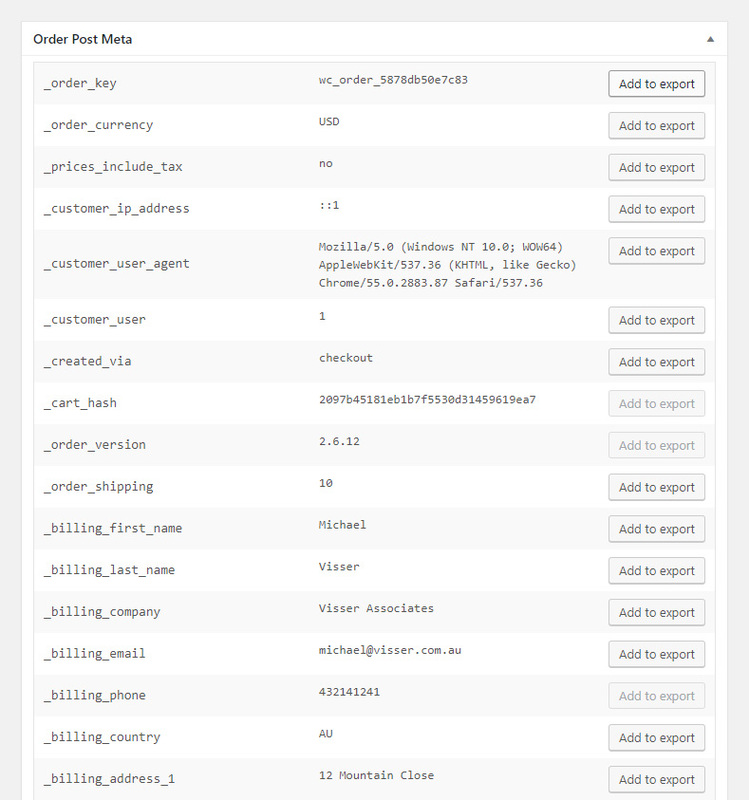 In the below example we’re uploading today’s Orders with an Order Status of Processing and Completed from Australia and New Zealand paid via PayPal to our supplier’s FTP server, this is happening every day at midnight. From the General tab we set the Export Type, Export Format and Export Method to suit our needs. 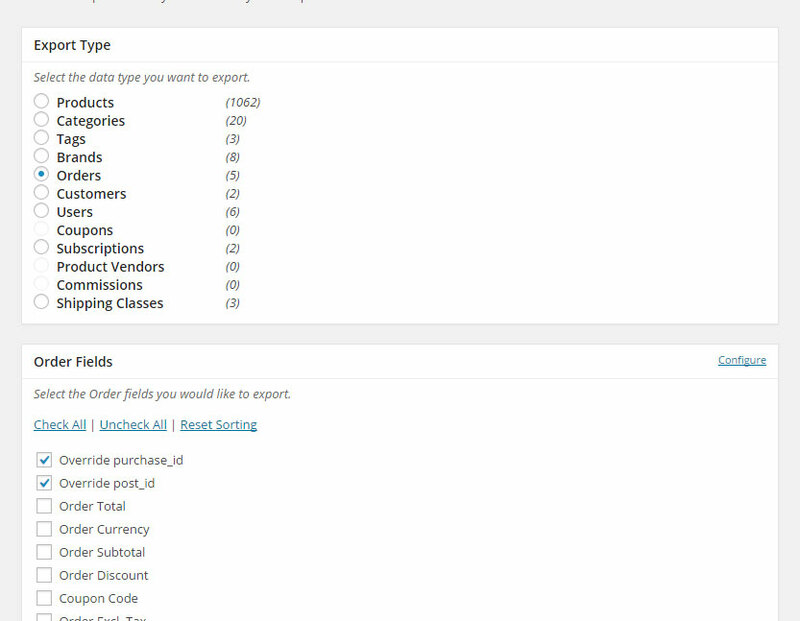 From the Filters tab we control what Orders we want included in the Scheduled Export. 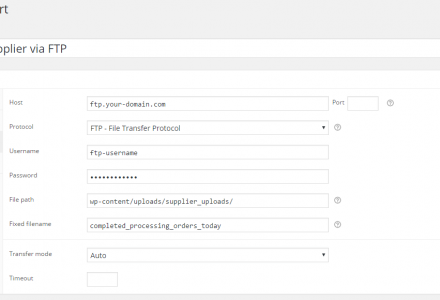 As we chose the “Upload to remote FTP/SFTP” Export Method we need to provide the connection details and fixed filename. From the Scheduling tab we confirm that we want this Scheduled Export to run daily starting from midnight the following day. Our Scheduled Export is ready to go! We can click the Execute to force the Scheduled Export to run now to test it. 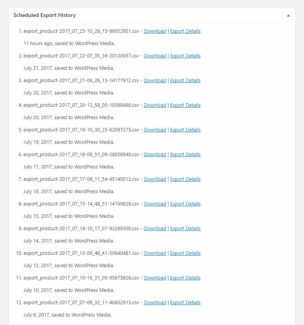 View the history of each Scheduled Export from the Edit Scheduled Export screen. Recent Scheduled Exports supports history pagination. 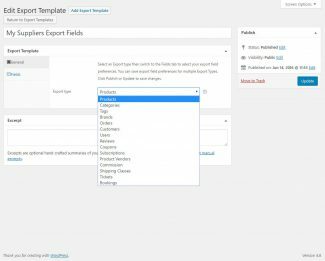 Store owners can now save multiple lists of export field preferences which can be assigned for use by individual Scheduled Exports. 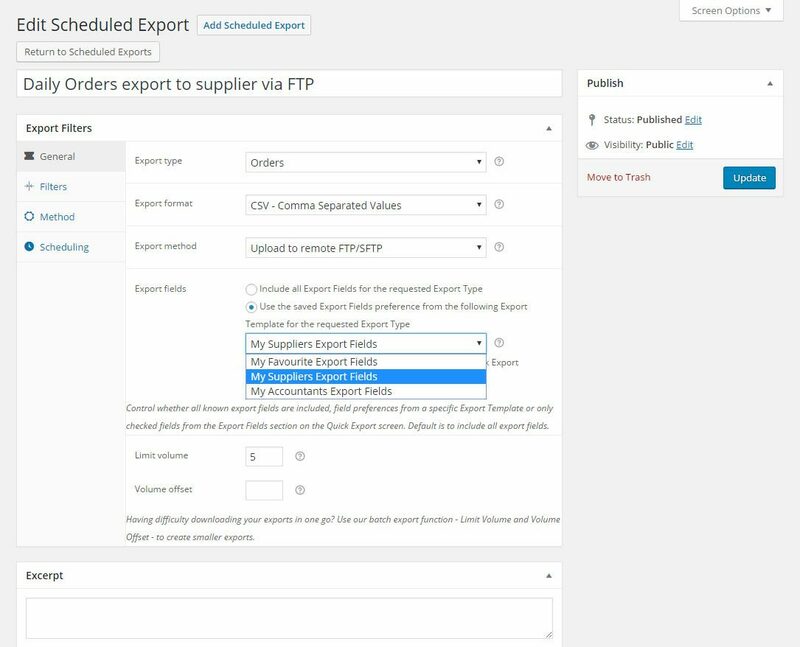 What this means is you can create a list of pre-defined export fields once and those export fields set in the Export Template will be included when specific Scheduled Exports are generated. 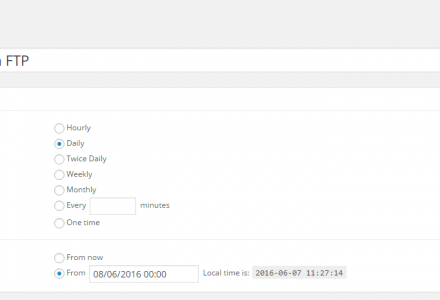 You control what fields are included in Scheduled Exports. 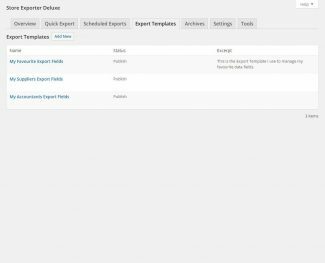 Create and manage Export Templates from the Export Templates section of the WooCommerce > Store Export screen. Each Export Template can hold multiple Export Type preferences. 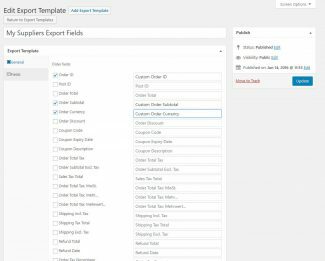 Export fields can be re-ordered by drag-and-drop, hidden via the tickbox or have a custom label assigned. 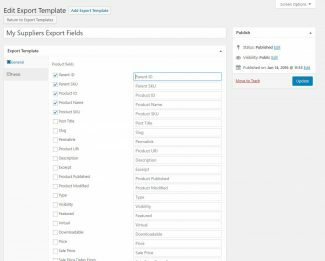 Apply the Export Template field selections by opening the Edit Scheduled Export screen. 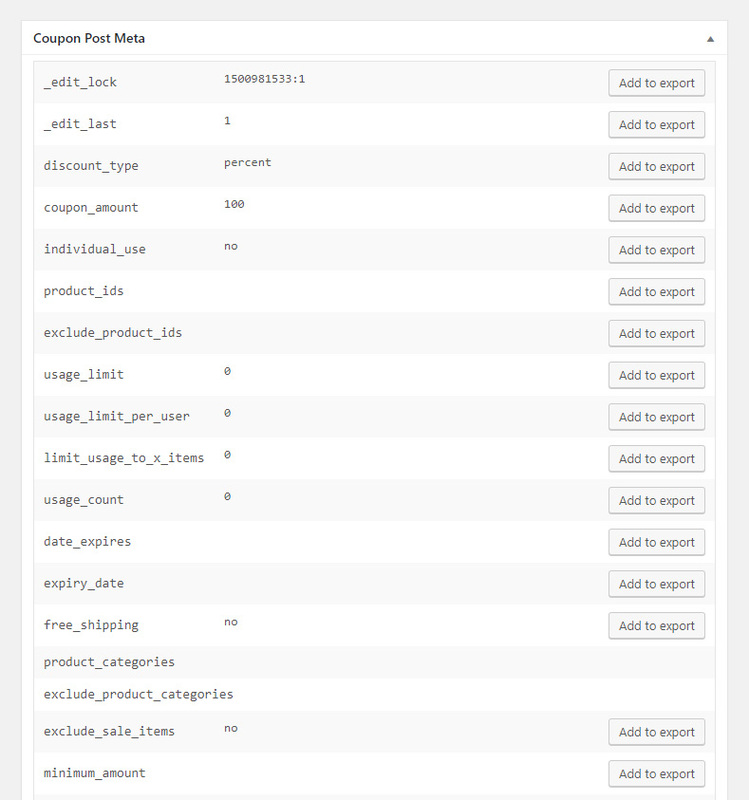 Add custom Coupon meta to exports directly from the Edit Order screen. 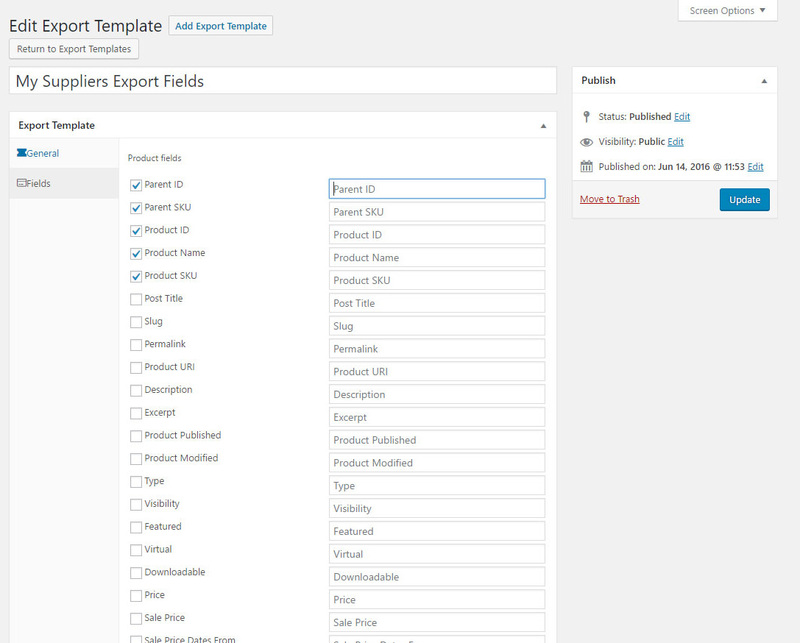 Add custom Product meta to exports directly from the Edit Order screen. Add custom Order meta to exports directly from the Edit Order screen. 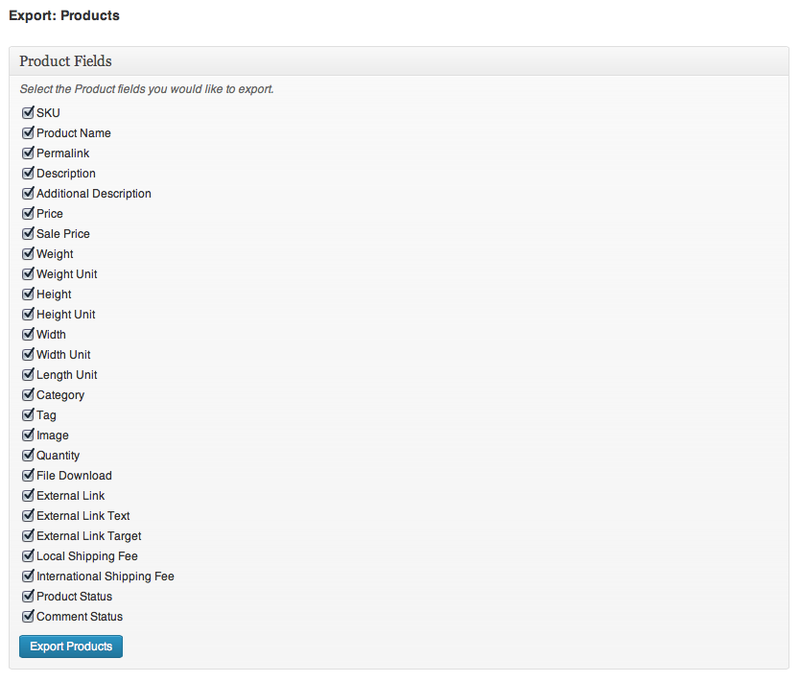 The Store Export dialog box on the WooCommerce > Status screen shows the overall status of Store Exporter Deluxe. If WOO_CD_DEBUG or WOO_CD_LOGGING are enabled additional options are unlocked and shown to the store owner. 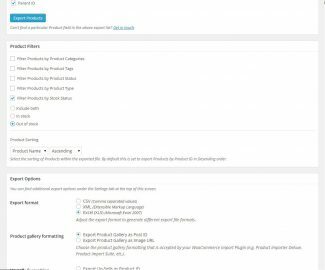 Want to only export a list of Products that are out of stock? Consider it done! 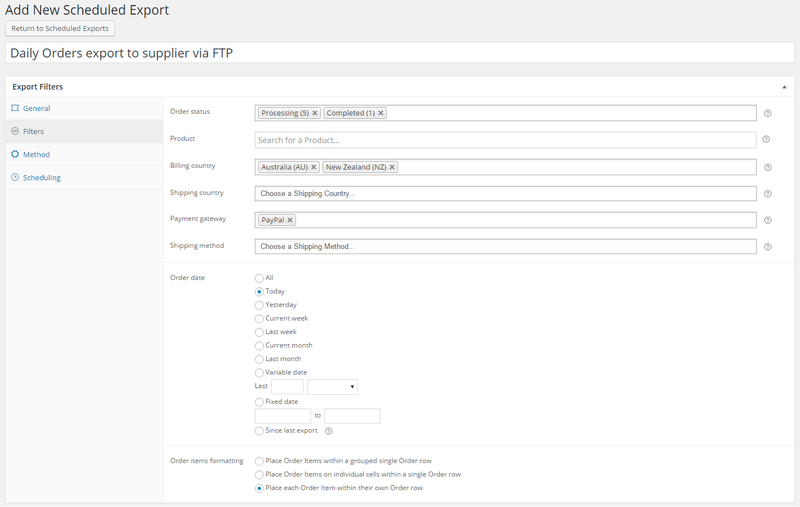 Export details of Orders generated within your e-Commerce store to CSV, XML or Excel (XLS and XLSX) formats. Detailed information on Coupons can be exported with Store Exporter Deluxe. A range of export options can be adjusted to suit different languages and file formatting requirements. Store Exporter Deluxe maintains compatibility with the latest e-Commerce updates and where possible we go out of our way to maintain legacy support. Store Exporter Deluxe is very simple to use. Store Exporter Deluxe supports more than just Products. if it’s in your store it can be exported! I am using both duplicator pro and woocommerce store exporter and i am absolutley stunned by the great support this team offers. THANK YOU SO MUCH FOR YOUR HELP MICHAEL!!! I tried almost every other data export plugin on the market, but each one would only do just a small part of what I needed it to do. Finally I found the store exporter plugin, and it literally did everything I needed, plus things I hadn't even though of! On top of that, the support is top notch, and goes above and beyond what you expect. Michael is not one of those elitist coders that talks down to you, which is unfortunately the case with many plugins out there. Great Plugin and best support ever. I had some very specific wishes nowhere to be found, and he made it work, even wrote some code for me. Thank you for your fantastic support and help with your Plugin. Excellent Support! Great Plugin that kills the competition. The Plugin works as expected, and the support is more than excellent. This is the go-to Plugin for us. 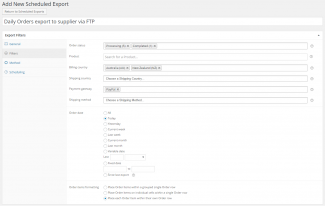 Whilst the WooCommerce Store Exporter Plugin is more than adequate there's many more possibilities and configuration options with the Pro export Plugin. On top of which the online support is exceptional. Thank you Michael for all your help. It's a great service you provide. We´re using this Plugin since more of one year. 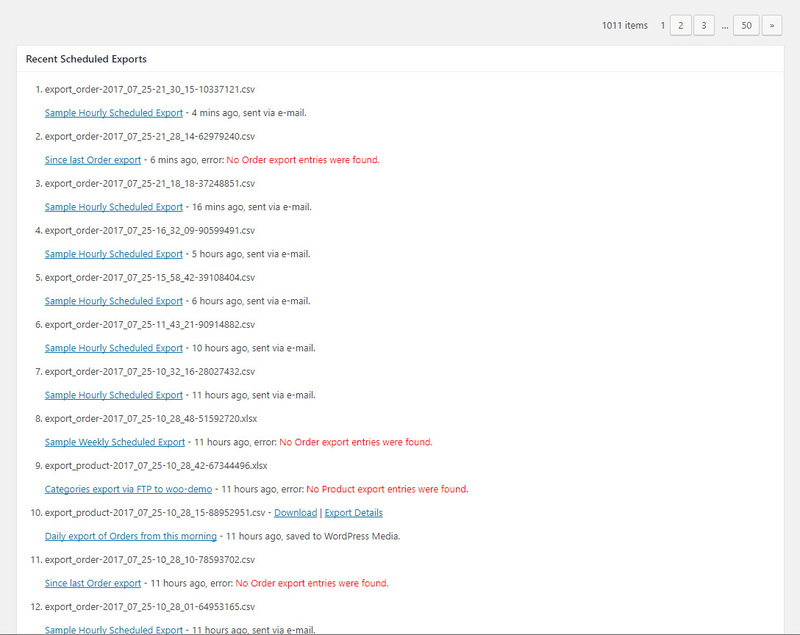 It is a really good Plugin but the more impressive thing is the post-sales support. Michael is the best! He help us with some modifications to adapt the Plugin to our site. THANKS MICHAEL! I’ve used this Plugin for 3 years now. Recently we've been trying to do something very specific to us and Michael and Morgan have come through again and again. The Plugin itself is well maintained, works exactly as expected, has legacy support and as mentioned the support is second to none. If you pair everything I've said with the money back guarantee you really have nothing to lose by trying this Plugin. Amazing! And fantastic support from the author as well. Highly recommend. We have tried several export Plugins out there, and this one is by far the best Plugin out there! Also the support is out of this world, seriously! Great Plugin, and even better Support. Michael worked with me to help implement the Plugin, and was so great about it. Excellent stuff, thanks! Excellent plugin and support, thrilled with the customization options and professionalism. Great plugin and absolutely amazing support! 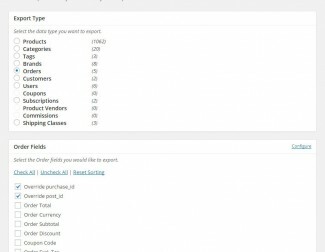 Don't bother with any other Woocommerce export plugins - this one has you covered from head to toe, and responsive, professional support to boot. I've been using Store Exporter Deluxe for just over a year. The performance and reliability has been excellent - as a tool to manage our WC store it's really important, we have just purchased additional licences and renewed our support for another year. Before using Product exporter we tried various alternatives, some were quite a lot more expensive and just didn't work very well, so I feel we get really good value. As far as support is concerned Michael has always been 10/10. Whenever we've had issues (usually caused by third party Plugins) he's always helped us to the end - I cannot thank him enough! My honest advice is if you have found Visser - use the products and don't waste your time or money looking elsewhere. As a bonus the constant updates and feedback go back into the development with fast updates - overall very impressive and a very happy customer. 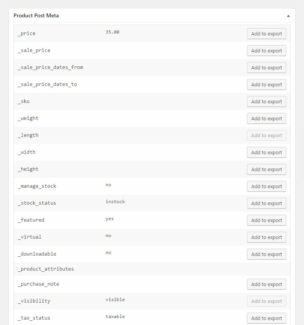 Top quality export Plugin for WooCommerce and Michael's support is beyond every support I've encountered. Excellent job! Excellent Plugin - Excellent Support. The Plugin itself is amazingly helpful. Never had big issues or anything and if you have a question, the support is extremely fast and friendly. It's like i could feel, how the developer of this plugin loves his work and because of that i am sure that i can expect a high-end quality Plugin. 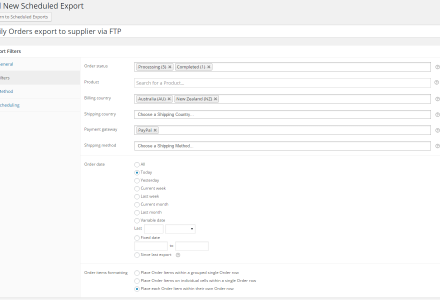 This is an excellent plugin for exporting reports and keeping track of data on our WooCommerce website. I've been using it for near 3 years. I've had 2 minor snafus with the Plugin. In both instances, I contacted Support and got good, quick responses. I appreciate the work the Plugin owner does. Good job! Recommend! I can recommend this plugin – especially the support. I needed a couple specific functions for my business and Michael took the time to implement and troubleshoot the whole thing with me. We had a critical requirement that our client needed. The customer support and service is exceptional. I won't hesitate to recommend this product to anyone! Great plugin and fantastic support! (If you should need it). Michael is quick to respond and solve any problems. 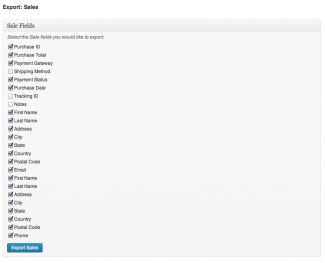 The plugin itself is easy to set up and customize to your needs with a bunch of filters for exact targeting. Super Pro version. Michael always available to help and solve problems. Thank you, thank you, thank you. Awesome plugin, and very friendly helpful support. Michael goes out of his way to help. The amount of extra code snippets, functions and support really is unheard of. Thanks! Great product, great support - although in fairness the product is good enough that support isn't needed most of the time. We had a specific custom request for exporting customer orders and Michael responded quickly and gave us an extremely effective solution. Absolutely delighted with this plugin and the support offered. We had a need with respect to importing woocommerce products with a lot of variations. Michael responded to our request and a few trials and cups of coffee later sent us a resolution that worked perfectly. It allows us to quickly update our products on an affiliates site with very little effort. Our affiliate was delighted and Michael made me look really good. Store Exporter Deluxe is an excellent Plugin, one of its kind. Loads of improvements and additions with every update. Even more important, the support is as good as it gets. Very fast, patient, and knowledgeable. Also there are support pages with a lot of excellent code snippets for customizations and improvements. I was always helped personal, and a feature request was processed very fast. Many thanks! We are currently migrating our store from WordPress to Magento and needed a quick and painless way to export our current Products. The process was incredibly easy and the developer was incredibly helpful in working with us to customize the output for our needs. Customer service response time was practically immediate, even though we are on opposite ends of the earth. I highly recommend this plugin and any others from Visser Labs! Really fast and helpful personal support for useful Plugin. I am a bit of a novice, but Store Export Deluxe is intuitive. When I have gotten stuck, I use the support page and Michael is very quick in getting back with the help I need. SED is also very flexible. I had to create an export with the exact number of columns and correct data to upload into an older custom 3rd party software program. I was able to sort the data fields into the correct order as well as inset blank column as needed by the custom software. Thanks again Michael. SED is a very useful plugin for exporting all manner of things. We had a problem recently and had to roll back to an earlier version. Michael got back from his trip and worked on it pretty quickly to find a fix. The Philadelphia Web Design Co. I had a bit of a problem with the plug-in. Possibly bought the wrong one. Emailed Michael, easy to find contact info, and he replied and refunded me in under 15 minutes … on July 4th no less. That’s some pretty damn good service. Have no concerns purchasing from Visser. You’re dealing with a grown up. Store Exporter Deluxe fit the needs of my client perfectly. We experienced an issue after install that Michael was able to solve for us in under 24 hours. Highly recommended Plugin and excellent support! Michael was very easy to work with and we were able to get our problems solved with incredible support after the purchase. I have never experienced such a high level of support and positive action on a Plugin as we have from Visser, ever. To say the response and attention to detail is exemplary is an understatement. We purchased this Plugin and had some issues caused by the way our site was originally constructed. Visser Labs worked on this after hours, over the weekend and came up with a revised product that just works. I am still astounded that we can purchase a product that is now a fundamental part of our business, and for such a modest amount, and have the level of service that I'd expect if we'd spent $20,000. Absolutely amazing. To think this is happening in Australia is a massive pat on the back for this developer. Store Exporter Deluxe works perfectly even for the somewhat finicky way that I have to use it. Michael quickly made the adjustments needed so I could export exactly what I needed from the my website. I strongly recommend this plugin and it I will definitely be using it again. Thanks Michael! Store Exporter Deluxe provides great flexibility and has met our order export needs perfectly over the past several years. When support is needed, it is prompt and friendly. Highly recommended! We absolutely couldn't live without this Plugin. And the level of support is way beyond anything I expected. I recommend Visser Labs' Plugins 100% to anyone. Really fast and helpful personal support for a really useful plugin. It is great for exporting product and order data for further processing with other tools. It's magic! 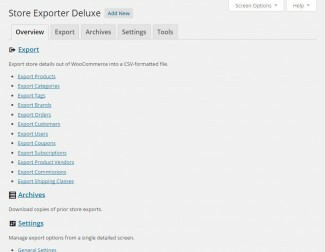 Store Exporter Deluxe is the perfect tool for export data from Woocommerce, it provides all features you need. Visser provides a great support. I'm ver satisfied. Thank you Michael for your fast support and for your great Plugin! Thank you, Michael! Everything is OK! This is a seriously well developed Plugin. Each time I look for extra functionality it's already there and when I ask for support I get reply within 24hrs. Nice work!! Didn't take long before I needed a couple of Visser Labs Plugins. Simple and providing that extra bit of functionality I was looking for. I love the amount of support you gave me for this Plugin. Thank you for helping my life be much easier with your Plugin! I love this support. I was having issues setting up custom tabs and in no time I got responses from support. He even created scripts for me to solve my problems. Fantastic Plugin and excellent support. I haven't found a more comprehensive export Plugin for WooCommerce and I searched everywhere! Plus, Michael went out of his way to answer my many questions until I got the highly customised export I needed. 'Store Exporter Deluxe' is not a luxury but a must-have. 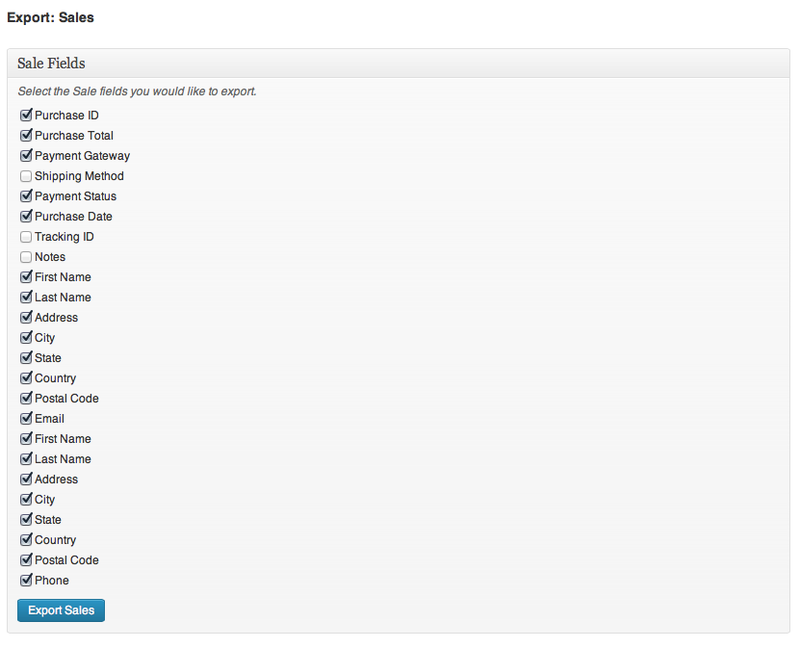 Now I can easily export any kind of dataset from WooCommerce for further analysis in Excel/Access according to my needs. But it is not just a great product but included in the package is a supersonic support. Really good plugin. The only one that allowed us to export every important type of content. Especially larger clients to a lot of reporting in Excel and the default WooCommerce reporting features are simply not enough. Great Plugin and super fast, friendly and very efficient support. After a great experience I recommend to everybody to upgrade to the 'Store Exporter Deluxe' version. It is worth every penny! Great Plugin with an amazing support! They are always nice and reliable... I'm happy to use their product! A really great Plugin with even better support of Michael! Thanks Michael for fixing the 1% I couldn't fix myself! 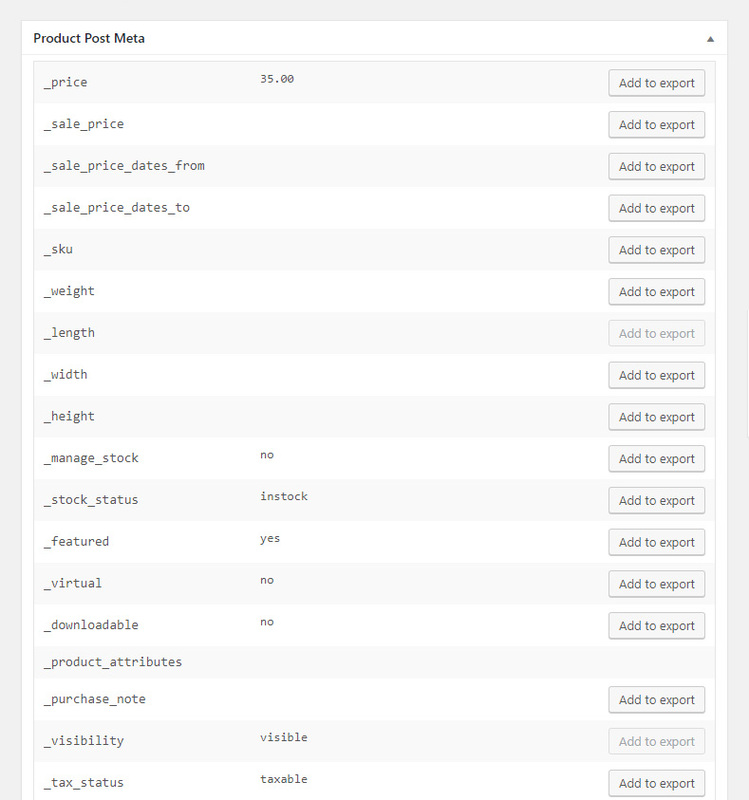 This is a quality Plugin and the only Plugin I've found that lets users export data from TM Extra Product Options in a genuinely useful way. I had to get in touch about a little bug I found and the support is truly outstanding - quick, clear and helpful. Can't recommend this plugin enough - thanks very much! This Plugin works very well and is very useful. The support is just great, they do everything to help you! Thank you very much! Great support!!! I work with a lot support of extensions/Plugins. This is rare!! I was answered and solved within days! Great and fast! Absolutely stellar support on a very versatile, flexible Plugin with many options. The only Plugin out there that ticked all the boxes for my client. I've had two issues now, the last one had absolutely nothing to do with this Plugin but Michael took the time to look into it and found the problem. Unlike so many plugin support desks that just tell you that their Plugin isn't causing the problem and good luck, here is one that wants to HELP :). Much appreciated and will continue to use with pleasure. The support I got from Michael has been absolutely incredible. He was able to pinpoint the very situational issue I was having with the Plugin and fix it. It means a lot to see this kind of depth in support for a Plugin. I wish more Developers put time into their customers like Michael here. 10/10 Plugin and 10/10 Support. If you need to rely on an export Plugin this is the one for you. Michael's support is second to none. He is quick, efficient and very helpful. Nothing is too much trouble for him and he treats each support request with enthusiasm and vigor. When you add to this how good the Plugins are it really is a winning combination. The export Plugin is by far the best one available for WordPress. Even the official WooCommerce one is nowhere near as good and their support is not great. When given the option between a Plugin from Visser Labs and another team, you should choose Visser Labs. You won't regret it. Many thanks for your help again, and your great Plugins! The support is very good! Quick reply and my problem was solved within a few hours. Great plugin and support. Thanku guys!!! Stumbled on a small bug that needed fixing. Michael excelled in his motivation to solve this problem. As others say, great support for the money. This Plugin is a lifesaver for me and my business. I'm blown away by the amazing support I received when I requested a new feature. Not only was the feature created but it was installed and tested on my site within days. I've had so many bad support experiences with Plugins in the past I can't say enough how amazing it is to receive this level of support. The Plugin itself is terrific and solves a number of business challenges for any store owner. I just wanted to say how impressed I am with this Plugin and the service you get for the price. As a new WooCommerce/WordPress user I'm blown away. Very powerful plugin, worth every penny! We use it on several huge stores for scheduled order exports sent to fulfillment and shipping partners. Great plugin with heaps of features. Support is excellent – we had a specific feature request which Michael turned around in record time. Best store export plugin around. The quickest support ever seen. Keep up the good work! Support for this module is fantastic! We were moving from WooCommerce to another platform and Michael went out of his way to be sure we could get all our subscription data we needed. To give this level of support to a short term customer isn’t common these days. Thanks again for going out of your way to support an older version! Not only a great plugin, but also one of the fastest and best support around! WOW WOW WOW! Ok a plugin has to work of course, but my site have already a lot of diffrent plugins, so when i activated the plugin it did not worked a 100% . After mailing my problem Michael fixed my problem in no-time! And every stupid question i asked he gave the best answer! I specially love the function to re-order the columns and rename them! THANKS THANKS THANKS! 5 stars 10 stars i give you the galaxy! The best WooCommerce export plugin, hands down. We've used several of them, and this is the only one that does everything we need, specifically robust support for the Extra Product Options plugin. Support is fast, thorough and friendly. Highly recommended. First of all, the support for the exporter and the importer is great: fast, personalized. Then, all I can say is that the Store Exporter Deluxe as well as the Product Importer Deluxe are awesome. I have used during 3 years other plugins (the Woocommerce ones), and switched to those a couple of days ago - they are just great, categories and pictures are seamlessly exported and imported (not the case of the other plugins, when it comes to large stores, believe me). I would have saved weeks of work if I had used these plugins since I started to work with Woocommerce! Very good plugin. It's doing what we want. And very good support : reactive and competent. Thanks! Thanks Michael. I purchased the plugin today. It works perfectly. Great plugin and great support. Thank you. The support here goes above and beyond to help and are prompt with their replies. Wish more Plugin authors would follow suit. I have both exporter and importer and let me tell you it makes life so much easier! In my case I have to import products from eBay (a seperate Plugin) on a weekly basis, then edit prices and such on each. Before I found these Plugins I was doing this by hand on 200+ products a week. These tools now allow me to import all my eBay data, export it to a CSV file, make all my edits and re-import. Took a job from 2-3 days a week to 3-5 hours a week! The Store Exporter Deluxe pick up where WooCommerce left. It allow us to export data with the great benefit of having daily schedule email exports. I have to say that support is one of the best i have deal with. Unfortunately i wish that WooThemes support would be as good and fast as Visser Labs one. 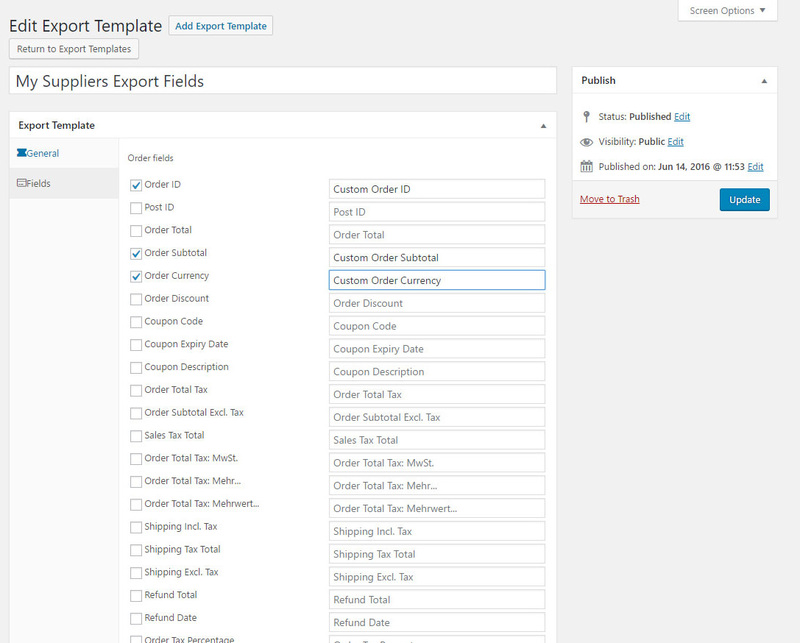 The ability to export custom fields with our orders had open new doors for reporting in our company. Keep the good work Visser Labs! Visser Labs did a fantastic troubleshooting and then pointing us in the right direction regarding our Store Exporter Plugin issue. Using the Store Exporter Deluxe now for several months on a daily basis. It is ideal to quickly download my order details from my WP web shop to Excel for back-up purposes and for further processing. Quick, easy and reliable. Support from Michael is swift and to the point. Quickly developing special needs on request. A no-brainer for every web shop. Very complete plugin and great support. I asked the developer to add a special field from another plugin and he did it quickly. Thanks! Great plugin, best support ever. Michael is extremely helpful! Excellent plugin, and even more excellent support. I needed a custom-build export for my webshop and Michael fixed it perfectly:-) I highly recommend this plugin! Michael is extremely helpful. He took the time to go above and beyond what was required. Thank you very much. thank you so much for your products and support. Michael is so patient, friendly and knowledgeable. i appreciate your work and will continue to recommend your products to my clients. Great plugin, exactly what I was looking for. And thanks for the great support. Issues solved within no time. I can do nothing but recommend you!!! Bought Store Exporter Deluxe a few months ago and ran into minor problems a few times. Both times the plugin authors were very kind and very helpful. Our problems were solved in a very efficient way! I can only recommend this product! Great plugin and great support. Visser Labs provided a fix for non-urgent issue in a matter of days (Friday to Monday) with kindness and professionalism. Keep up the good work. We've purchased your store exporter and you have helped us getting it back up and running again when our system was fubar'd. Now to prevent this happening in the future I'm setting up a second shop with a better base, fewer plugins, no cron-castrator and everything set up to auto-update (I inherited the old shop with a gazillion plugins). perfect support, very professional. The plugin is working like it should. Excellent plugin. And even better support. He responded right away to my help request, and kept me posted on his progress as he fixed and sent me an update to the plugin that solved my problem. We use the scheduled export feature and love it - before having this plugin I use to have to go in and manually do an order export and email it to my accountant, but with this plugin I can have it automatically be sent to her. Super nice. I also like the options for what to include in the export. And the ui of the plugin has come a long way too. Great work!! Thanks! Very good Plugin to make a full export of your site. I used it to connect our store with Unit4 for the inventory through FTP and it worked. Also the support team was very helpful and quick with their response. Superb service and a great plugin. Michael was very receptive to requests for new features. Can't fault the product or service! Thank you visserlabs for helping and guiding me through a troublesome time with my client's website. You went way beyond the call of duty to get things fixed. I bought the plugins and Michael has been super helpful with his support. Unfortunately one of the plugins was beyond my Wordpress skill level and Michael was again helpful and didn't hoard my funds as some others might have done. Thanks for your help and advice! We really needed a booking export that works for us and now we have it! Really thank you for the kind and good support! For any future buyers, you can buy this plugin without thinking twice about it! This is by far the best plugin on the market. Thank you again Michael!! All the best! They fixed my issue only few hours after I contacted them. This plugin does everything it promises! And the support is great as well! I purchased this plugin a couple of days ago because I needed an xml export from my products for an affiliate partner. This xml export should be updated automatically and my affiliate partner should be able to download the xml export whenever they want with a separate link. I had a little bit of trouble establishing this but with the excellent help of Michael from support everything was set up in a couple of days. The xml file is now exported to the server and renews every day! Store Exporter Deluxe is an awesome plugin! Helps me a lot for exporting from Woocommerce! Simple to use, with a big range of options. I highly recommend this addin for exporting to excel/list/... purposes! Visserlabs offers great, uncomplicated support with excepional response time! Thank you for exchanging the WP ecommerce Exporter Deluxe for the Woocommerce version in such a timely fashion. After converting my online shop over to Woocommerce I can see how useful the exporter deluxe will be in extracting product and sales data in an ongoing way. I advised this problem. It turned out that it was appropriate option. It was enough to export orders and appeared with every client list of their products. BTW this is great and powerfull plugin! Your plugin is fantastic ! I’ve been using Store Exporter Deluxe for just over a year. The performance and reliability has been excellent – as a tool to manage our WC store it’s really important, we have just purchased additional licences and renewed our support for another year. Before using Product exporter we tried various alternatives, some were quite a lot more expensive and just didn’t work very well, so I feel we get really good value. As far as support is concerned Michael has always been 10/10. Whenever we’ve had issues (usually caused by third party Plugins) he’s always helped us to the end – I cannot thank him enough! My honest advice is if you have found Visser – use the products and don’t waste your time or money looking elsewhere. As a bonus the constant updates and feedback go back into the development with fast updates – overall very impressive and a very happy customer. 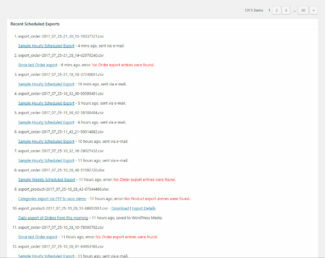 Top quality export Plugin for WooCommerce and Michael’s support is beyond every support I’ve encountered. Excellent job! 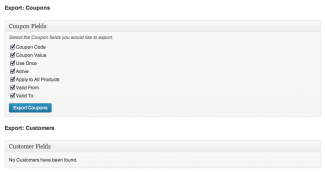 Excellent Plugin – Excellent Support. The Plugin itself is amazingly helpful. Never had big issues or anything and if you have a question, the support is extremely fast and friendly. It’s like i could feel, how the developer of this plugin loves his work and because of that i am sure that i can expect a high-end quality Plugin. 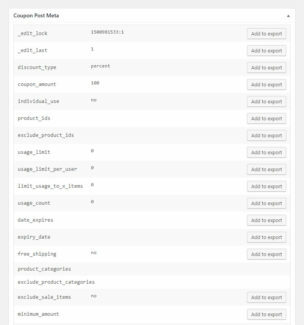 This is an excellent plugin for exporting reports and keeping track of data on our WooCommerce website. I’ve been using it for near 3 years. I’ve had 2 minor snafus with the Plugin. In both instances, I contacted Support and got good, quick responses. I appreciate the work the Plugin owner does. Good job! Recommend! I won’t hesitate to recommend this product to anyone! Great product, great support – although in fairness the product is good enough that support isn’t needed most of the time. Hello, we need to send our WooCommerce orders to a dropshipper. They said they take it through EDI or SFTP. Can your plugin do this for us and how would it work? Would it work with custom SFTP specifications that they said they will be giving me? Also, do you help to set it up?Thank you. Hi Joe, thanks for asking, I’m not familiar with EDI business processes but it sounds like a CSV file so we definitely support that. If they require a XML file we do that too! 1. Can it export only the instock products? 2. 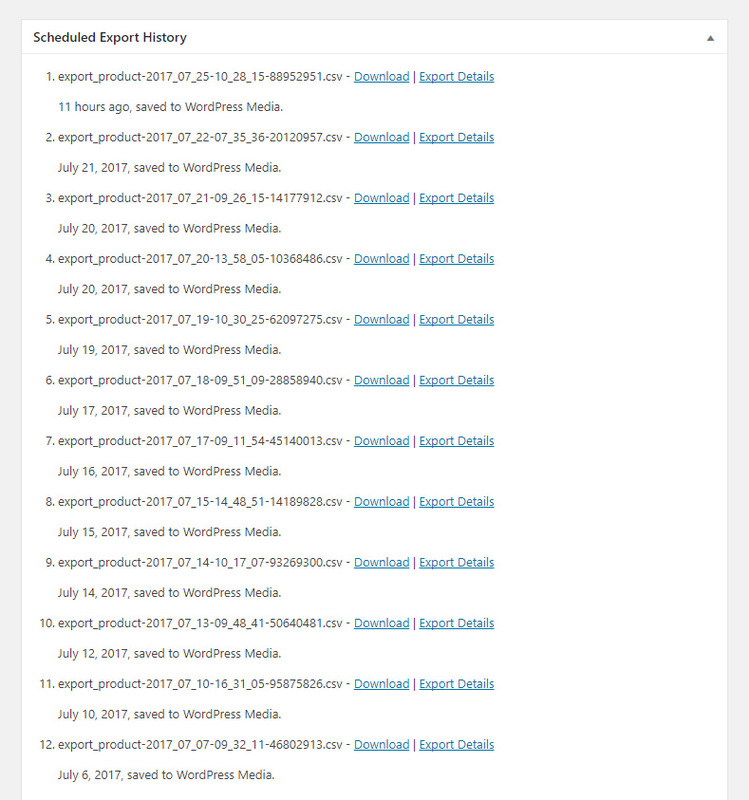 Can the plugin be sheduled to make an XML export on daily basis? 3. Can the export XML file be customized and can I add custom fields with a specific value? Hi Ivan, thanks for asking and the answer is a yes, yes and on the third point could you provide a URL to the sample XML Product format? Please see the dedicated Supported export fields and Export supported Plugins pages available from the Documentation section for this Plugin. Can I tell Store Exporter Deluxe to create automatic exports every 24 hours? 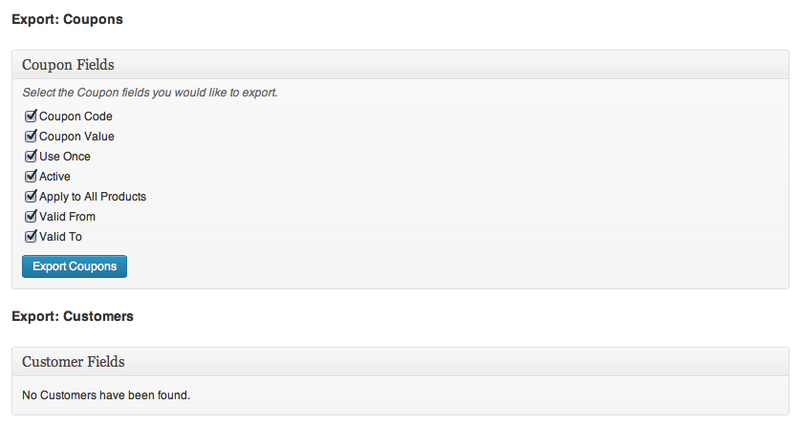 Yes you can, even better you can configure multiple Scheduled exports for different exports (e.g. a daily Orders export that is sent to the Store Manager and hourly Product exports to sync up with a price comparison website). Can I integrate Store Exporter Deluxe with [insert name] Back Office/Point of Sale system? If your preferred Point of Sale platform supports importing records (e.g. Products, Orders, Users, Customers, Coupons, etc.) from an external URL then this is likely doable, do check the restrictions of your back office platform before assuming that our Plugin will be compatible or contact us for more information. Don't fret, have a look at our detailed troubleshooting guide on the Usage page, if your issue persists please open a Support ticket with us and we'll be promptly in touch with you. Our answer is almost always yes! Drop a comment here on this page with your idea or shoot us a message on our Visser Labs Facebook Page. Need to ask something specific? Store Exporter Deluxe comes with a Quick Start document (readme.txt) to help with installing the Plugin, a detailed Usage document is also maintained online. Additional support can be found from the Contact page or methods below. Looking for support, a copy of the readme or usage instructions? 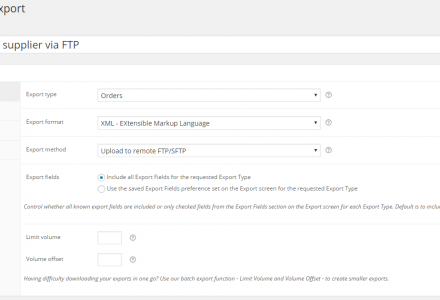 Check out our Documentation for Store Exporter Deluxe and learn how to take full advantage of the Plugin. If you have any problems, questions or suggestions please join the members discussion on our Store Exporter Deluxe forum. As the end-user you’re driving this Plugin’s future. Here's how you can help. 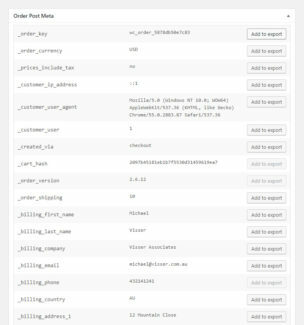 Export store details out of WooCommerce into simple formatted files (e.g. CSV, XML, Excel 2007 XLS, etc.). If you currently have our basic Store Exporter Plugin activated within your WordPress site we will do our best to automatically de-activate it to avoid conflicts with Store Exporter Deluxe. See Usage section before for instructions on how to generate export files. If you have any problems, questions or suggestions please join the members discussion on our WooCommerce dedicated forum. 2.3 is a major update introducing compatibility with WooCommerce 3.0's new CRUD data structure, efforts to provide backwards compatibility will continue but you are recommended to upgrade to WooCommerce 3.0 when possible. 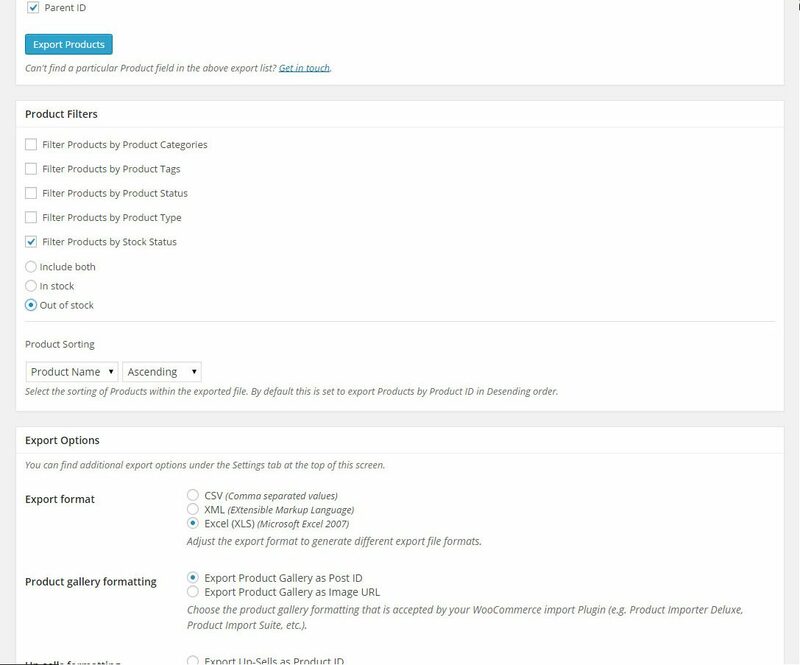 2.0 is a major update introducing our new Scheduled Export engine, so it is important that you review your Scheduled Export settings after updating from WooCommerce > Store Export > Settings > Scheduled Exports. I am absolutley stunned by the great support this team offers. I tried almost every other data export Plugin on the market, but each one would only do just a small part of what I needed it to do. Finally I found Store Exporter Deluxe, and it literally did everything I needed, plus things I hadn't even though of! The support is top notch, and goes above and beyond what you expect. Michael is not one of those elitist coders that talks down to you, which is unfortunately the case with many Plugins out there.